Tonilee Ruden, senior Health Promotion intern, stands with patient Brian Younger, a Lynchburg firefighter who recently underwent a Supraventicular Tachycardia Ablation under the care of Dr. Kuk, an Electrophysiology Cardiologist for Stroobants Cardiovascular Center. Our health promotion major (BS) or minor is your gateway to the healthcare industry. 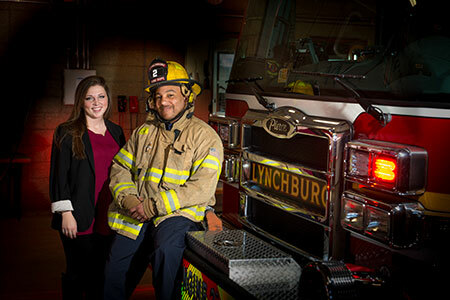 University of Lynchburg is the only private college in Virginia to offer this program, and 96% of our graduates are working full time or going to graduate school. We work with you one-on-one to customize your course plan based on your career goals, and our internships give you the crucial, practical experience that employers love. You can also pursue certification as a Certified Health Education Specialist. You will explore health care at a broad level by studying the physical, social, emotional, spiritual, mental, and environmental factors that influence the health of individuals and communities. Featured courses include Drugs and Behavior Management, Healthy Aspects of Aging, Foundations of Health Promotion, Nutrition, Human Disease, Medical Terminology, Global Health, Psychosocial Aspects of Health, and Dimensions and Foundations of Health and Wellness. Many students go to graduate schools to specialize in occupational therapy, physical therapy, physician assistant, public health, pharmacy, chiropractic medicine, sonography, dentistry, podiatry, dermatology, optometry, and radiology. Worksite Wellness Coordinator for: Halifax Regional Health Systems, T. Rowe Price, MedStar Health, Med Assurant Inovalon, Inc.